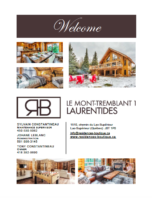 Contact Sylvain about any questions you may have regarding the cottage. Contact Johane about any questions you may have regarding your booking. Contact Tony about any questions you may have regarding the company or for investment opportunities.